•And, of course, the ever-popular “Japanese people don’t go to court to resolve their problems” (taxi drivers, the man on the street, and just about everyone else). Foreign legal scholars such as Mark Ramseyer and John Haley are renowned for their efforts to provide competing hypotheses involving economic theory (Japanese people act economically rationally within the context of how their legal system works) or explanations of the institutional constraints imposed on people trying to resolve problems or achieve change through the legal system in Japan. Sadly, I have little to add to the big picture in this debate, and as a foreigner I am totally unqualified to speak about the “legal consciousness” of the Japanese people on a first-hand basis. I will nonetheless offer my own two cents on one feature of the Japanese legal system that probably is truly unique: cartoon mascots. The country probably has more “image characters” (as they are also called) used in law- and government-related PR than any other country on Earth. Given how the Japanese police make a concerted effort to remind people of their presence on billboards, posters and placards everywhere (including multilingual versions of “A Place Policemen Patrol” signs at banks and other locations, presumably intended to dissuade shifty foreigners from their criminal propensities), Pipo-kun, the vaguely creepy mascot of the Tokyo Metropolitan Police, is the character most likely to be recognized by many readers. With big ears (for listening to the people), anime eyes (for looking into every nook and cranny of society) and an antenna (for, uh, more listening, apparently), smiling pictures of Pipo-kun are a common feature in a wide variety of police PR in the capital. I once thought that his name came from the sound of a police siren (“pi-po” in Japanese onomatopoeia), but it is actually derived from a contraction of “pipuru” (people) and “police.” At this point some readers may feel that I could have at least included an official graphic of Pipo-kun, but since someone was recently prosecuted for criminal trademark infringement for selling T-shirts showing a stick figure holding a gun to the head of a silhouette of him, I’m not taking any chances. Another character who some visitors to Japan may have noticed at the airports is Kasutamu-kun, the pudgy pooch modeled on a drug-sniffing dog and used by customs authorities to welcome people to Japan while telling them not to bring in drugs or fake Louis Vuitton handbags. Fewer travelers, however, are likely to have seen the Tokyo Immigration Bureau’s mascot bird, Toripu; the only place I have seen it is on a notice from the bureau inviting visa overstayers to avail themselves of the government’s “return order” program. Those who leave Japan under a return order are only prohibited from coming back for a year rather than the five- or 10-year period that would otherwise apply. Since police and immigration officials are occasionally implicated in alleged human rights abuses, it might be fun to see their mascots square off against the Ministry of Justice’s human rights champions, Jinken Mamoru-kun and Jinken Ayumi-chan (names which mean “protect” and “advance” human rights). It might not be much of a match, however, since Mamoru and Ayumi mostly appear in PR exhorting Japanese people to be considerate of other people’s feelings and to think more about human rights, rather than anything dealing with, say, prolonged detention, forced confessions or the right to counsel. In Japan it apparently the Japanese people rather than the police or other government actors who are the biggest abusers of human rights. Ayumi and Mamoru would also be heavily outnumbered since, in addition to Tokyo’s Pipo-kun, prefectural police forces around the country have created a virtual menagerie of law enforcement mascots. Most of these are animal-themed, though the Nagasaki cops have a robot named Catch and the Toyama prefectural police avatar is an anthropomorphic mountain. The law enforcement team would be further bolstered by the mascots developed by regional prosecutors’ offices. The three statute-book-toting ninja representing the district prosecutors’ office in Tsu, Mie Prefecture, look particularly dangerous, the cartoon peanut chosen by the Chiba prosecutors less so, though his name — Rakkaseigi-kun — is a nice pun meaning “Peanut Justice Boy.” Just don’t call the nice man with the badge that when you ask to speak to your lawyer. 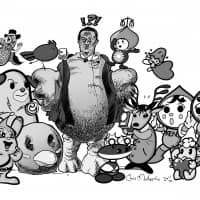 Mamoru and Ayumi could seek aid from a host of regional human rights mascots, like Kurashiki’s Kupitto, a white blobby-looking creature clutching an enormous red heart to her chest, or Kumamoto’s Kokkoro, a weedy-looking sprite with a flower hat and wings shaped like a heart. But the human rights mascots tend to all look happy yet frail, unlikely to stand up to the fangs, teeth, throwing stars and walking mountains arrayed against them. But perhaps the police mascots too are mostly interested in badgering the citizenry to behave properly. The Kyoto Bar Association also just introduced a character devoted to lobbying for greater transparency in the criminal justice system, specifically the full recording of police interrogations. This is perhaps the only mascot I have seen which is neither smiling nor childish-looking. A serious-looking deer holding a camera, its name — Kashikashika — is another play on words, combining the nuance “there must be transparency” (kashikashikanai) with the word for deer (shika). While I personally quite like this mascot and am happy to finally see one that doesn’t appear to have been designed with kindergarten students in mind, some online commentary has noted that Kashikashika looks a bit, well, criminal. Given the number of grumpy-looking perverts who get arrested for doing things with cameras, perhaps it’s a fair comment. This is not the only example where one is left wondering how much thought went into legal system-related graphic design. The logo for Hoterasu, Japan’s government-sponsored legal aid system, is an umbrella made out of the sun. While a perfectly nice, professional-looking image, it suggests either a sun parasol that bathes you in UV radiation or a rain umbrella that you never actually need — oddly mixed messages indeed. One of the stamps the government issued to mark the start of the lay judge system in 2009 seemed to convey a similarly confused message. It features nine birds (presumably representing the three professional judges and six lay judges who compose the panels now used to decide serious criminal trials) sitting on a scale. Easily-startled, bird-brained creatures deciding how the scales of justice will tilt by sitting on them — a far-from-reassuring image! No discussion on the subject of mascots (or lay judges) would be complete without mentioning Saiban-inko, the cartoon parakeet developed by the Fukuoka prosecutors’ office to publicize the lay judge system used in some criminal trials since 2009. With yet another pun name (saibanin = lay judge, inko = parakeet), this image character got some high-profile publicity in 2008 when Justice Minister Hatoyama was shown on television wearing a Saiban-inko costume as part of the PR effort leading up to the system’s introduction. Personally, I think this particular incident illustrates something very important about how government works in Japan — I’m just not sure what it is. Is it a matter of the bureaucrats being so in control of everything that they can just decide “Hey, let’s get our minister to wear a bird costume after his next Cabinet meeting” and actually make it happen? Or is the minister in fact so powerful that he can announce to his underlings, “Today, I shall wear the parakeet costume on national television,” and nobody can do anything to stop him? Neither answer is particularly reassuring. 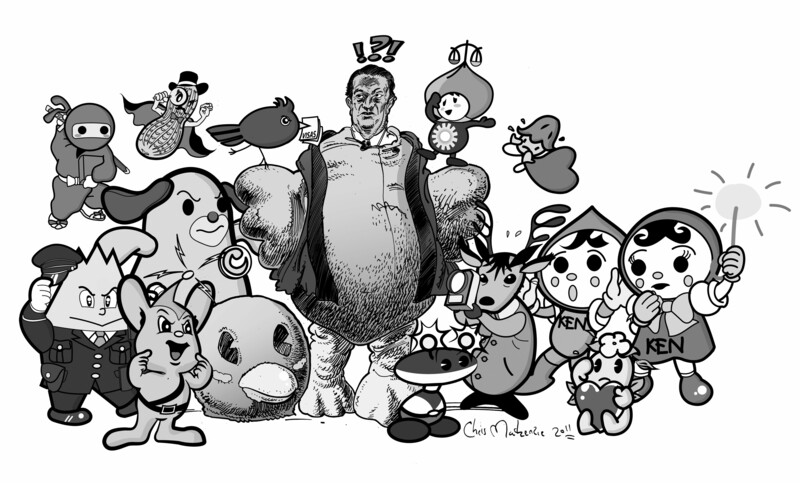 To be fair, Mr. Hatoyama may have just been doing his bit for the kids, since cartoon mascots are frequently used on government websites and other PR for children. This is probably a good thing, given how dull some of the things government does can be. The Ministry of Internal Affairs and Communications has Denpa-kun (radio-wave boy), a cartoon superhero with a cape and lightning-bolt hair, to help teach children how to use radio waves in compliance with the Radio Law. Meanwhile, over at the National Personnel Authority, Koh-chan, another blobby white character with a big “K” on her chest is available to bore innocent elementary and junior high school students into submission by helping to explain how the bureaucracy is administered. Although not directly related to the legal system, it is probably timely to mention some of the cartoon mascots deployed to help explain how, er, safe nuclear power is. There is Puruto-kun, the image character used by nuclear authorities to market plutonium-fueled nuclear power. He even appears in a cartoon explaining how safe plutonium is — safe enough to be swallowed (he explains this while holding hands with a little boy drinking a glass of water presumably laced with plutonium). Just try not to inhale any, he is careful to add. (You used to be able to see the whole video on YouTube, but it has recently been removed, apparently due to Japan Atomic Energy Agency complaints about copyright infringement.). There is also Nato-chan, whose mission is to spread the word about the sodium (natrium) cooling process in fast-breeder reactors such as the Monju plant in Fukui (which, despite being Extremely Safe, suffered a major accident in 1995 followed by an embarrassing attempted coverup). The Fukushima Prefecture Nuclear Power Marketing Association has Uran-chan, a purple-clad pixie with a glowing wand who helps explain nuclear power on the association’s website, though she doesn’t appear to be taking any questions these days. And then there is Gen-chan, the very happy and very radioactive-looking mascot of the Environmental Radioactivity Research Institute of Miyagi Prefecture. Poor Genchan seems to have little to do, though, since the institute’s website was last updated in July 2010 (nothing noteworthy has happened since then, I guess). Using child-friendly media to explain the functioning of government is hardly unique to Japan. In the U.S., even the once super-secret National Security Agency now has a website for children called Crypto-Kids, featuring the Cyber-Twins. The difference is that Japanese cartoon mascots are often used to send messages to children and adults alike. Kasutamu-kun is used on the customs authority website to invite people to report smuggling activities. Pipo-kun (and his family!) appear on the Tokyo Metropolitan Police website in a number of places that children would not normally look — their page telling people not to send money to telephone fraudsters, for example. And Tappy and Mirai, the pair of cute cartoon dogs used as mascots by Osaka Prefecture, probably have nothing to say to children at all, since they are used to encourage adults to pay their taxes (Tappy’s name, by the way, is derived from the seemingly oxymoronic combination of “tax” and “happy”). The integral part that manga and anime play in Japanese culture may go some way toward explaining this, but I suspect two other factors are at work. One is the general tendency of Japan’s nanny state to treat even its adult citizens as children, and its children as idiots. The other is just my own pet theory: Although becoming a public servant may ensure fabulous job security, it is also likely to involve decades of boring administrative tasks. The occasional opportunity to participate in something fun, like the creation of yet another mascot character (possibly at the taxpayer’s expense) may thus function as a type of perk for some public servants, helping to diffuse the vast amount of tedium and frustrated creativity that doubtless accumulate within the bureaucracy. Whatever the reason for their existence, the plethora of cartoon mascots that decorate legal and governmental institutions add some much-needed color to an area of life most Japanese people doubtless find soporific. I would, however, venture to point out one glaring omission from this mascot menagerie: the death penalty. For some reason there is still no smiling image character helpfully explaining to children and adults alike why the death penalty still exists and how it is carried out. The need for a child-friendly spokes-mascot is arguably even greater now, since the Supreme Court recently affirmed death sentences for murderers who were legal minors at the time of their crimes. The obvious choice of character would be a cartoon crane named Tsuru-chan or Tsuru-kun, “tsuru” being another pun on the words for “crane” and “hang.” That cranes have long necks would be an added bonus. Sometimes these articles just write, or in this case draw, themselves. Japan needs your mascotPlease drop us a line with your ideas for mascots to represent any branch of the Japanese bureaucracy, national or local. Alternatively, create one yourself and send in a JPEG file of your idea. The best submissions will be published and/or interpreted by illustrator Chris Mackenzie alongside next month’s Light Gist column. Send ideas to community@japantimes.co.jp by 6 p.m. on Friday, Sept. 23.